D2 Racing Sports has produced a high quality complete coil over system for our automotive needs. Giving the enthusiast the perfect coil over system which is fully adjustable with a 36 point damping adjustment, adjustable ride height, and even camber adjust-ability for some applications. 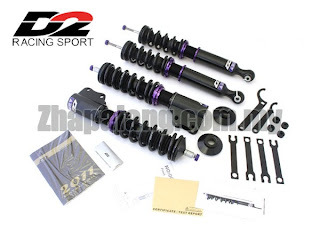 D2 Racing Coilovers are the solution to upgrading your suspension without the hassle of having to purchasing everything separately and worrying about compatibility issues. * Pillow ball mounts included w/ camber plates!